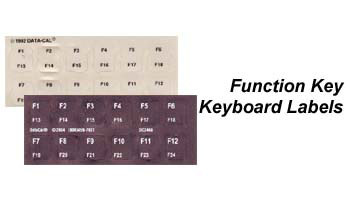 Function key keyboard labels show the standard F1 through F12 function keys as well as the F13 through F24 keys. Label sets are available in black letters on beige labels or white letters on black labels. Function Key Labels are a complete set of labels (F1- to F12) with markings up to F24. The keyboard labels are designed to fit desktop and laptop computer keyboards. Laptops with smaller than standard keys may not be compatible with these labels.